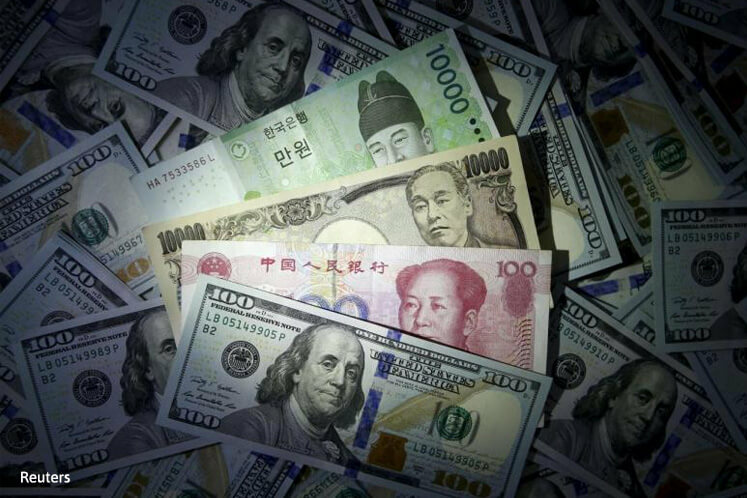 (March 21): Some Asian currencies weakened slightly on Tuesday as investors looked for fresh cues following the currencies' big gains last week on the US Federal Reserve's moderately dovish stance. There was not much reaction to comments by Chicago Fed President Charles Evans, who reinforced the perception that the US central bank would not accelerate the pace of its interest rate hikes. The Taiwan dollar saw slight gains on the back of strong equity markets, while the Philippine peso declined because of a rise in importer dollar demand. The Thai baht and the Singapore dollar also traded weaker against the US dollar. "Markets are hard-pressed to look for new and enduring themes. And none emerge; at least not compellingly so," Mizhuo Senior Economist Vishnu Varathan said in a note. Technical indicators such as the relative strength index showed that some Asian currencies were near over-bought levels. Ever since the Fed's interest rate projections released last week showed that it was sticking to its outlook for a total of three rate hikes this year, rather than increasing the projection to four hikes, the won has risen more than 2%. The Taiwan dollar and baht are up more than 1%. "The USD may rebound intermittently as some regional currencies such as the TWD and THB have been technically overbought." Qi Gao, FX strategist for Scotiabank in Singapore, said in a research note. The reversal in U.S Treasury yields after two days of declines did not help emerging Asian currencies either. The 10-year US Treasury yield stood at 2.4789% on Tuesday, slightly up from Monday's US close of 2.472. A steady fall in the U.S Treasury yields drove investors to the emerging markets last week. Analysts said Asian currencies were also cautious amid some Brexit uncertainty, the French presidential election, and next month's European Central Bank policy meeting. The South Korean won rose to 1,114.0 per US dollar at one point, the won's highest level since Oct 11, 2016. The won's rise came as domestic equities rose, with the main index hitting a two-year high on expectations of upbeat first-quarter earnings. Foreigners have bought a net US$2.8 billion of South Korean equities so far this month, about 10 times their level of investment in February, the exchange data showed. The won is Asia's best performer against the US dollar this year, with an 8% gain.